Andrea Chong Brás, the author of this story, is the Community Manager of Localization Lab. She has worked with Jaqi Aru in the project that translated the Orbot app into Aymara. A virtual community of Aymara language activists from Bolivia has translated the digital security app Orbot in their native language in an effort to help its speakers be safer online — as well as to make their tongue better represented in cyberspace. Orbot, a downloadable app on an Android phone, creates a private mobile internet connection by encrypting traffic and hiding it by bouncing through a series of computers around the globe, a useful function when accessing private banking information over public wifi or sending personal information online. It is the first time this type of app is available to Aymara speakers thanks to Jaqi Aru, a community of volunteers that since 2009 promote Aymara translation and content creation online. The group’s past projects include the translation of Facebook’s interface, and its ongoing projects include translating articles for Global Voices and promoting translation and content creation in Aymara on Wikipedia. Aymara is an official language of Bolivia and parts of Peru and is spoken in northern Chile and Argentina. It is one of the few indigenous languages of the Americas with more than one million speakers — yet, like many minority languages, its online representation is low. Many studies have attributed the high rates of school abandonment in Bolivia’s rural communities during the 1980s and 1990s to aggressive pro-Spanish language policiesthat alienated speakers of indigenous languages. Centuries of colonial rule by Spain coupled with policies that favored Spanish in educational and institutional settings led to severely marginalized indigenous communities. This meant that indigenous languages were “exiled to the home sphere” — leaving many embarrassed to speak native languages in public. 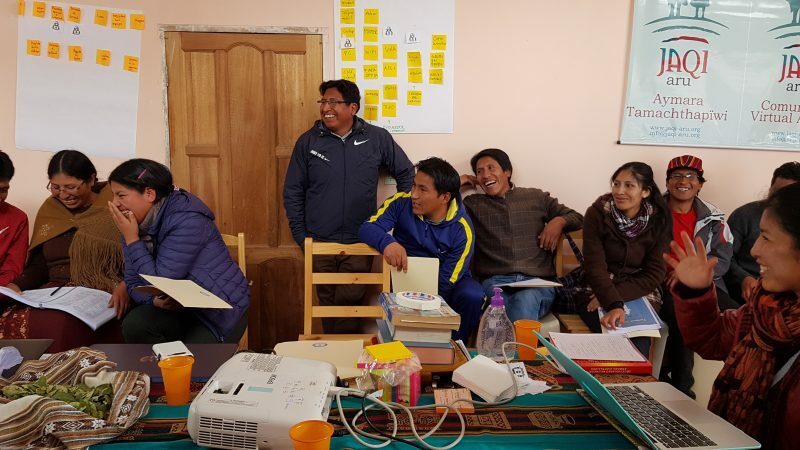 Recent changes to the education system have shifted the focus towards linguistic diversity, but speakers of indigenous languages still face disproportionate levels of discrimination in Bolivia — with serious consequences for the Aymara-speaking people. Although nearly 17 percent of Bolivians identify as Aymara speakers, the language is considered threatened, with some estimating a 2 percent decline in the number of speakers every year. As rates of Internet penetration continue to rise in different parts of the world, so does the demand for technology in diverse languages. There is a growing need for “localization“, or the process of adapting content to local audiences.